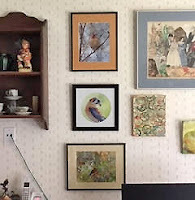 I was focused on helping set up her Ellengant Creations Etsy Shop and did not think to take a picture of my artwork to share. Ellen was nice enough to send me a picture along with a couple of others from where she had my work hanging. 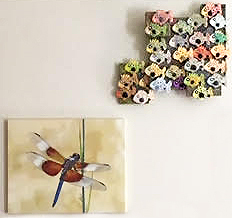 My "Blue on Blue" dragonfly gallery wrapped canvas hangs with a fanciful school of polymer clay fish Ellen created for the Inspired by Nature exhibit we were both in last year. She also displays one of my "Psychedelic Gazelle" prints on a wall in her house.